Navigating large or complex XML documents can be difficult, so to address this a number of navigation aids have been added to all of the XML editors. These indicate the current position in the XML document, and when you select a new node, the cursor is automatically moved to the appropriate place in the document. All the views are updated in real time as you type, making these essential productivity tools. Document Outline View - displaying all the XML Elements and attributes along side the XML document and updated in real-time as you type. Selecting a node in the tree takes you to the corresponding place in the document. Breadcrumb Bar - similar to use as the navigation bar in Windows Explorer, the breadcrumb bar makes it easy to see all the parent XML elements back to the root of the XML document. Selecting a breadcrumb item navigates to the appropriate place in the document. Global Component Locator - a filterable list of Schemas, Complex Types, Elements and Simple Types that relate to the active XML Schema (XSD). 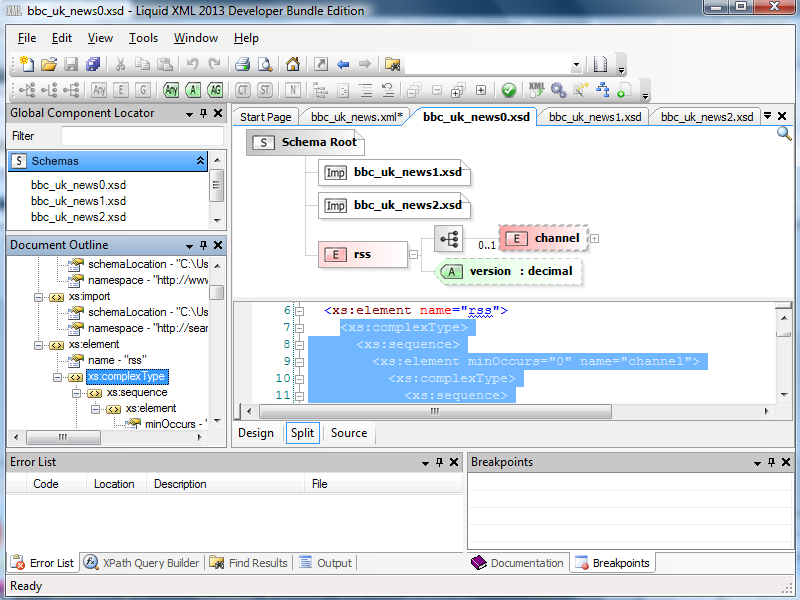 Selecting a node in the list moves to the Graphical representation in the XSD editor. Navigating large XML documents can be a real headache, particularly if you happen to be working with XML Schema. XML is not always particularly readable, so working exclusively in a linear code editor can be troublesome and unintuitive. 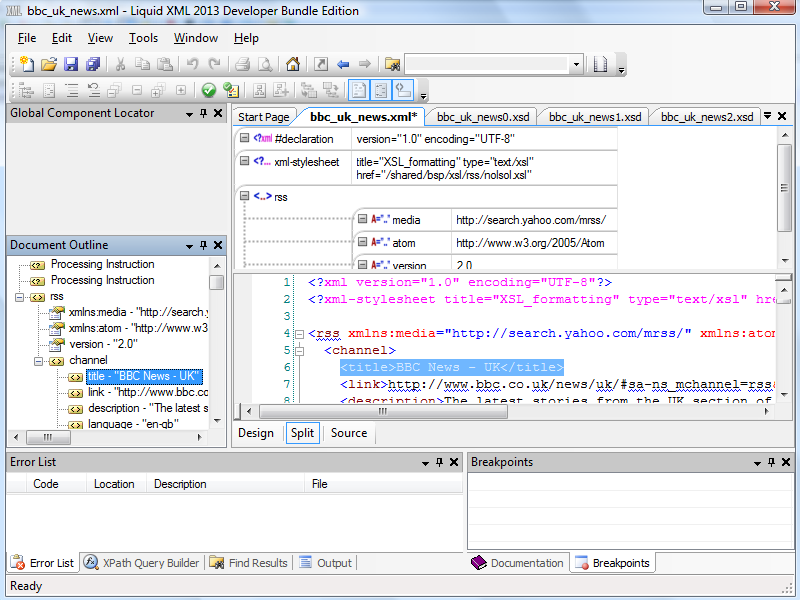 Liquid Studio is designed to minimize the difficulty of navigating large amounts of XML data, using multiple navigation components which exploit the structural nature of XML markup. The Liquid Studio interface navigation tools are designed using familiar UI component styles you instantly know how to engage with. With the Design View, Document Outline, Breadcrumbs and Global Component Locator, you can explore and edit your data in intuitive ways. The views are in sync with one another, so each navigation channel updates in real-time as you interact with the data. 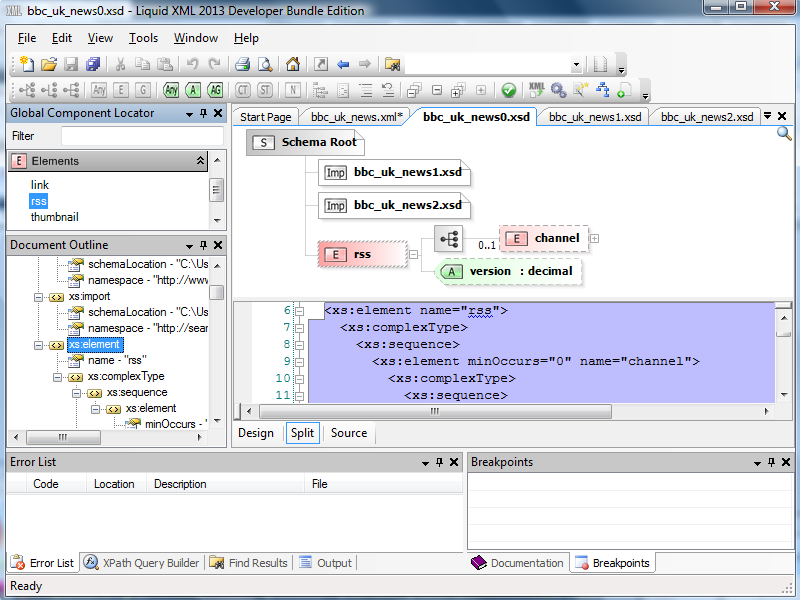 When you open an XML document in Liquid Studio, you can opt to view it using the Design View, the source code editor or a split view including both of these. 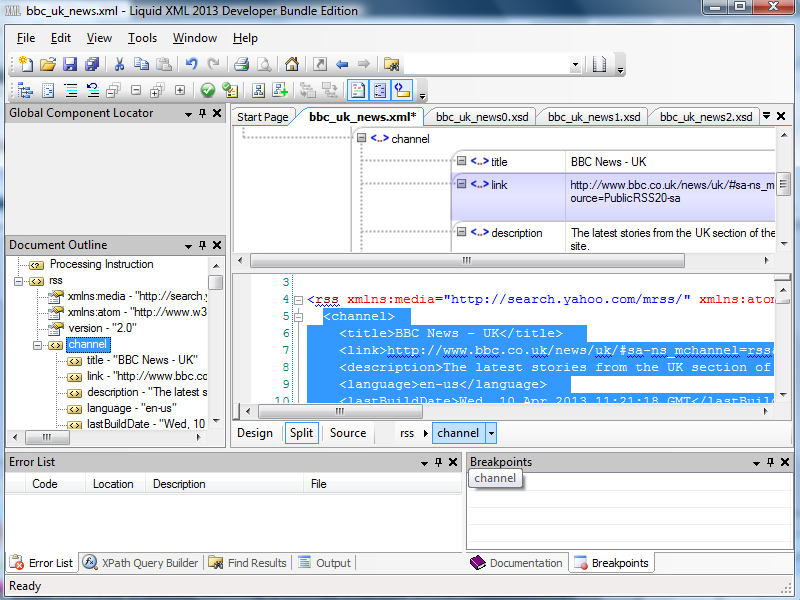 As well as allowing you to edit the data, the Design View is one of the primary channels for navigating your source code. By expanding and collapsing elements in the Design View, you can browse through the content of your data much faster than you would using the source code directly. When you select an element or attribute anywhere in the Design View, the source code editor instantly jumps to that section and highlights the relevant code excerpt. Data items selected or edited in the Design View are simultaneously highlighted and updated in the Document Outline. 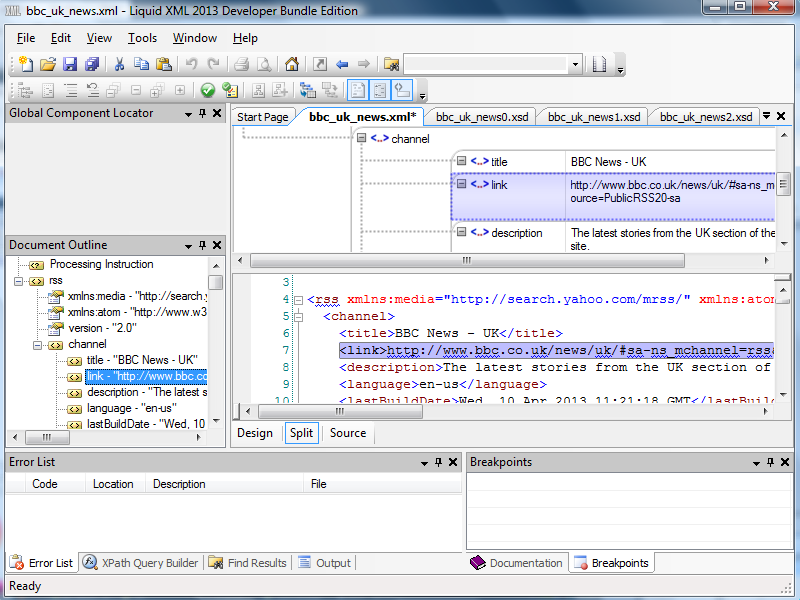 Selecting an element in the Design View navigates to it in the source code and highlights it in the Document Outline. Selecting an attribute in the Design View also facilitates navigation in the source code and Document Outline. The Document Outline presents the data tree structure for any XML you are working with. You can navigate the source data by selecting elements and attributes in the Document Outline, expanding and collapsing to control your view of the tree structure. The icons let you see which items in the Document Outline are elements and which are attributes at a glance. 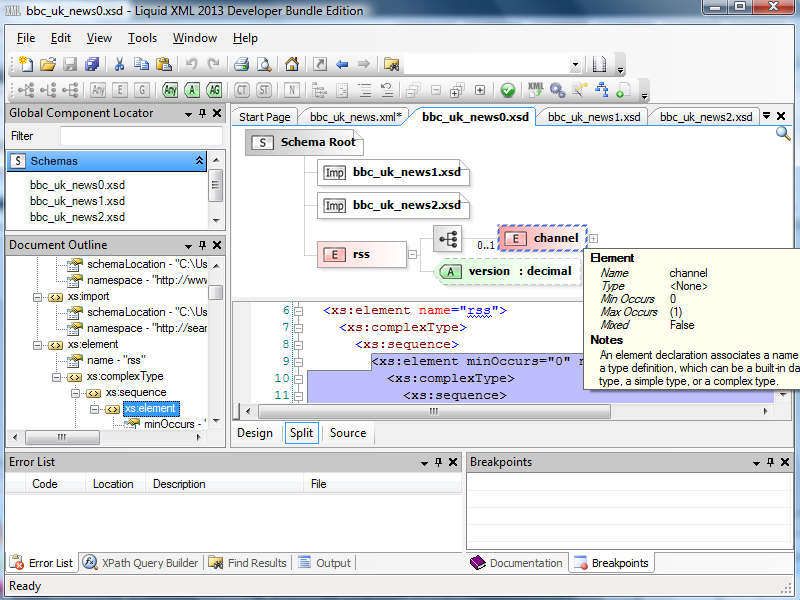 The Document Outline displays an interactive view of the data structure. 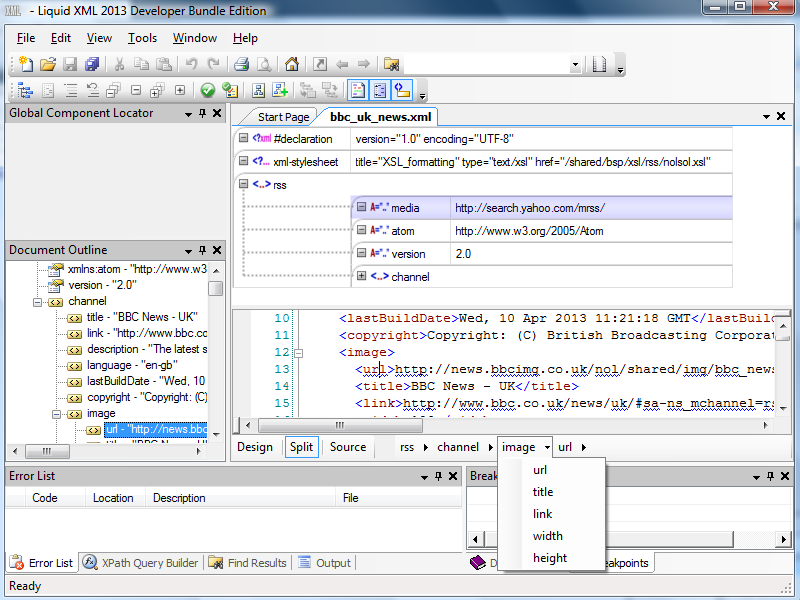 On selecting an element or attribute, the relevant portion of the source data is presented and highlighted within the source code editor, with the cursor positioned ready for editing. 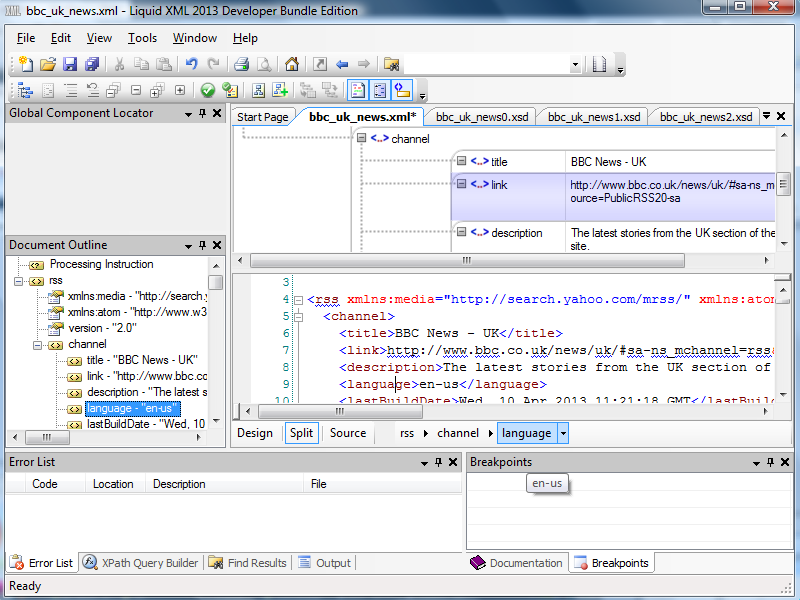 Selecting an element in the Document Outline presents it within the source code editor. Selecting an attribute in the Document Outline also presents it for editing, with elements and attributes easily distinguishable by their icons. 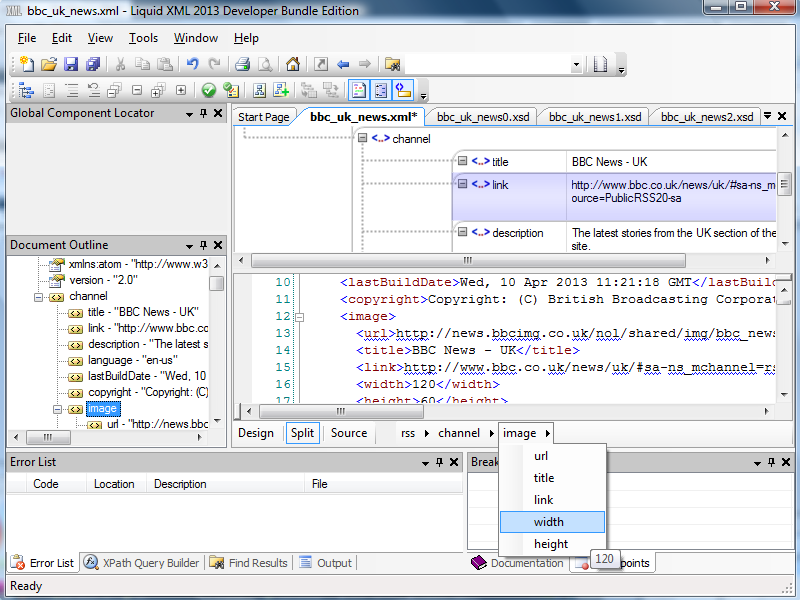 The navigation elements in Liquid Studio are responsive to one another. When you edit or browse the source code in an XML document, the Document Outline updates to reflect your position in the data. What is presented in the Document Outline is always relevant to your current source code editing task, showing you the context you are working within. When you carry out edits to your source XML code, the Document Outline display updates in real-time. The Document Outline highlights any section of source code you are working with and reflects edits as you type them. When you are editing or browsing source code data in the Liquid Studio editor, you can use the Breadcrumbs that appear beneath the source for fast navigation. The Breadcrumbs indicate your relative position within the data tree structure, with each Breadcrumb representing a parent element, starting at the root and working down to your current node. As you navigate the source code, the Breadcrumbs update to display your structural position within the data. Breadcrumbs indicate parent and child elements relative to the node you are browsing or editing. You can use the Breadcrumbs to navigate your data, selecting a Breadcrumb to highlight its element in the code and move to the opening tag for editing. You can navigate directly to any of the parent elements displayed, quickly jumping up the document tree. To navigate to the start of a parent element, select its Breadcrumb. You can navigate the source by choosing any of the displayed Breadcrumbs. The Breadcrumbs allow you to navigate the source tree in both directions. By selecting the arrow that appears next to a Breadcrumb, you can see the child elements for that particular parent. The child elements are listed as siblings alongside one another in the drop-down list. Select a child element to navigate the tree and the source code editor will instantly take you to that element, with the Breadcrumb list also updating. Each Breadcrumb is accompanied by a drop-down list of its child elements. 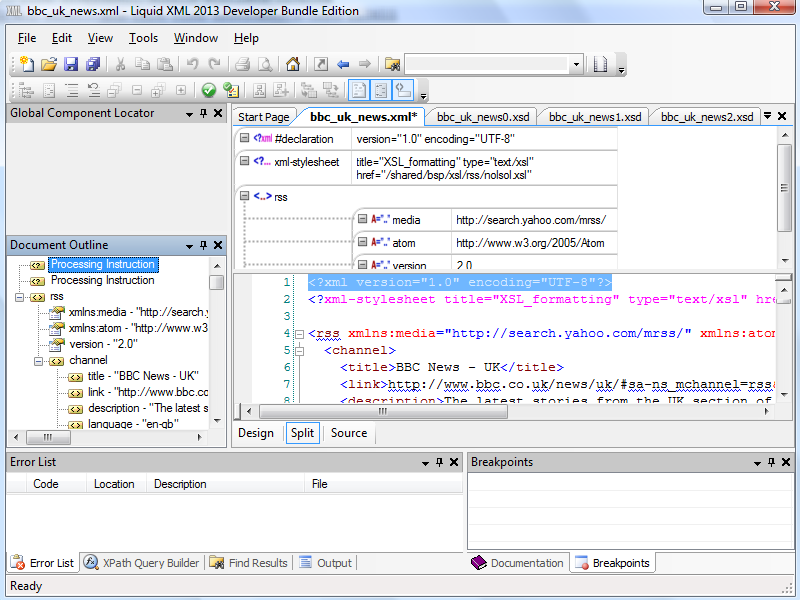 Liquid Studio navigation is designed with XML Schema in mind. 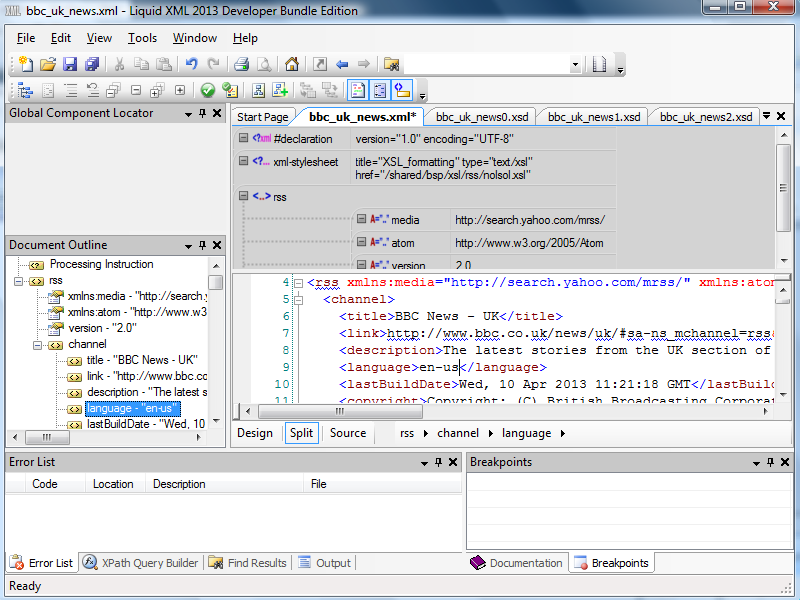 Navigating XSDs is particularly useful if you are defining an XML Schema or are validating your XML data against one. You can work with XSDs alongside your XML source data, navigating them using the same techniques as for the XML itself. 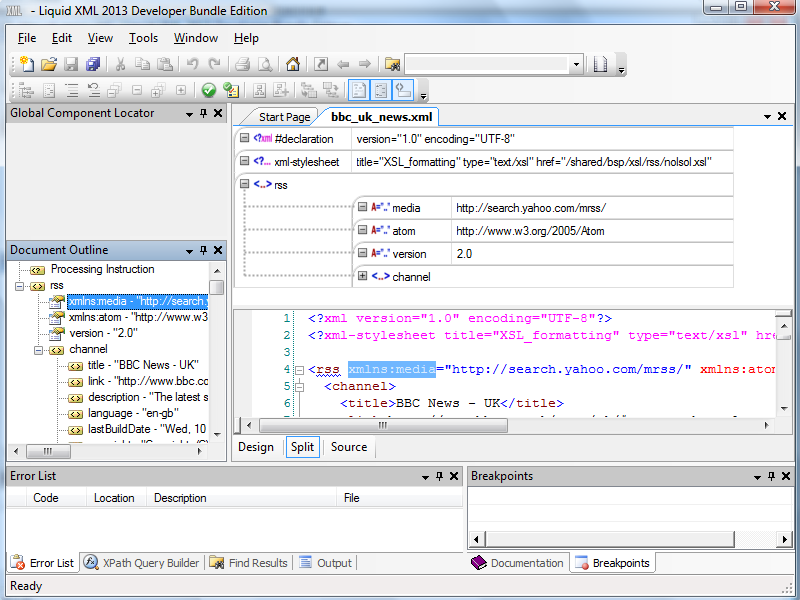 The display elements in the UI are tailored to XSD content, using the same interaction model as for standard XML but with specialized presentation settings for XML Schema structures. You can use the Design View to navigate the content of an XML Schema Definition you have open in split view. Elements you select in the Design View are automatically highlighted and navigated to both in the XSD source code and in the Document Outline. 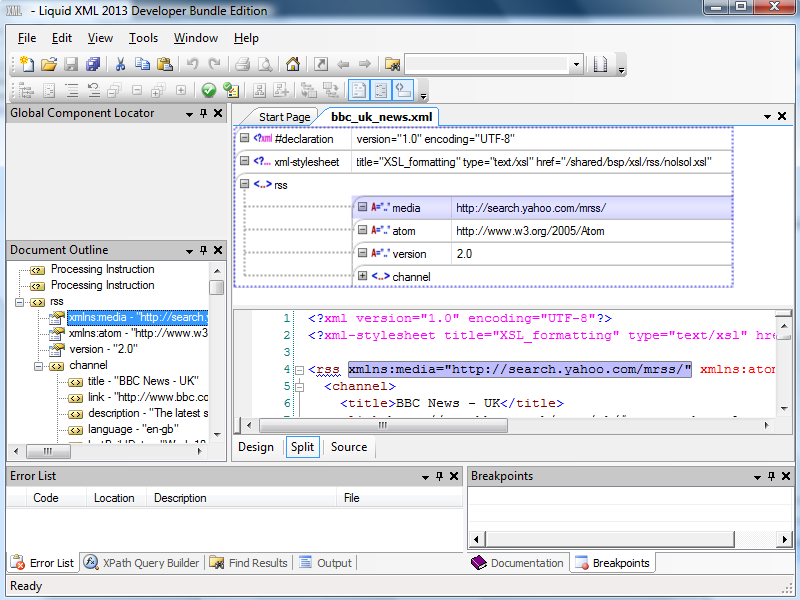 You can use the Design View to navigate an XSD, with the UI tailored to XML Schema structures. You can also navigate your Schemas using the Document Outline, with elements and attributes clearly distinguishable. As with standard XML data, the Document Outline highlighting is updated as you browse through and edit your XSD source code. Navigating the XSD can also be achieved through the Document Outline. In the Document Outline, you see branches in the tree for each of these elements: xs:element, xs:complexType and xs:sequence. In the Global Component Locator, you see a list of the elements actually being defined within the XSD, so in this case RSS is displayed. Within the Global Component Locator is an overview of the structure defined by an XML Schema. If your XML Schema extends into multiple XSD documents, for example where more than one namespace is being used, you can navigate between these documents directly from the Global Component Locator. The Global Component Locator allows you to navigate an XML Schema defined in multiple XSD documents. 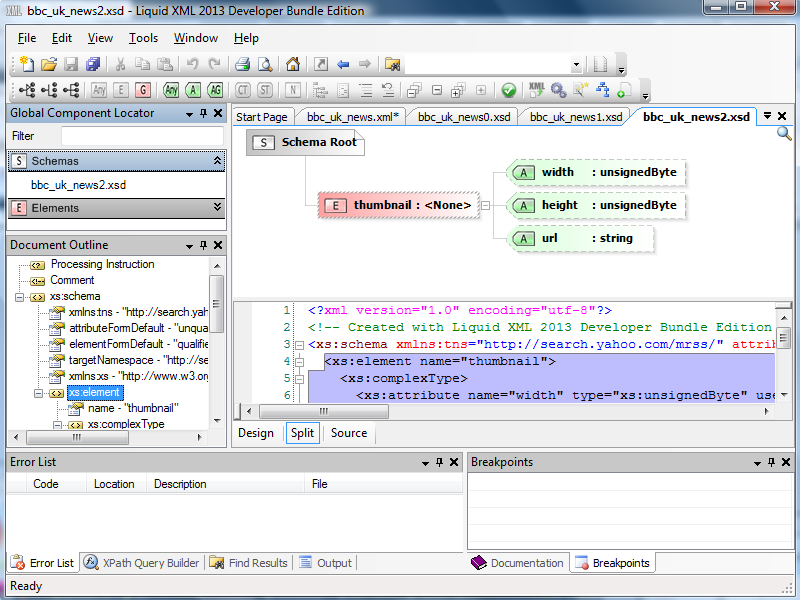 The Liquid Studio interface provides an interaction model that reflects the tree-structured nature of XML data. The need to navigate source code in a linear fashion is dramatically reduced through the Design View, Document Outline and Breadcrumbs, with the Global Component Locator providing an additional level of structural navigation for XML Schema. These utilities present a contextual navigation model that stays in sync with your editing tasks, making any part of your data accessible in as few clicks as possible. The UI is designed with typical XML development activities in mind, striking a balance between visibility and relative simplicity, providing quick navigation links that are continuously relevant to your current task.